Rain!!! We stayed the night in Altoona and left for Sand Patch on Labor Day morning. My schedule was simple enough, catch a few trains a Sand Patch, then drive home to Michigan, Mother Nature had other plans. Severe thunderstorms were forecast, but we didn't know about them until Johnstown. They hit with a vengeance and we were down to about 20-25 mph for some good stretches of road. At Sand Patch I hiked down to the East portal and waited in the rain. I was rewarded in 15 to 20 minutes with an Eastbound Amtrak. The skies cleared when we drove around to the West portal where we caught a Westbound TOFC. All of the images on this page are video-captured from our Sony 8mm camcorder. 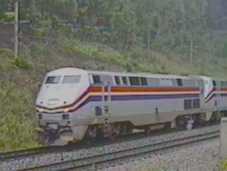 An Eastbound Amtrak train is about to enter the West portal of Sand Patch. The 2 Genesis engines leading the train of Superliners and material handling cars emerge into the rain. Side view of the AMD-103's. MPEG video of this Amtrak train going by, click here. 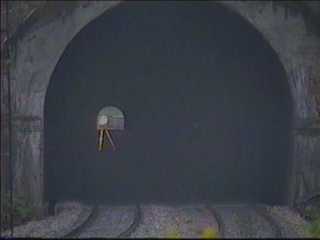 A Westbound TOFC/COFC stops just outside of the West portal to uncouple the helpers on the back-end. The 3 GE's are accelerating Westward with the pushers giving a final assist. Looking toward the tower at Sand Patch. This auto bridge offers a good vantage point, but the tunnel cannot be seen from it. 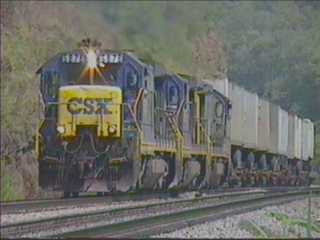 MPEG video of this CSX intermodal, click here.